For a lot of people, self-care is that essential set of behaviours which only come to mind when you are very stressed or close to burning out. They know it is important but somehow, manage to go on without it…till it gets nearly impossible to go on! Sounds like you? I know you are busy and it’s impossible to spare any time. 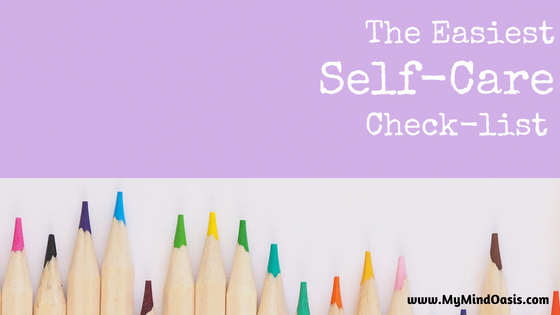 So, I am going to share one of my most basic self-care checklists with you today. Something that does not require you to put aside any time to follow. Yes, you read that right! Keep this checklist handy and answer five simple questions any time you feel stressed/ upset/ irritable or low on energy and motivation. 1. How long has it been since your last proper meal?...EAT! 2. How much water have you consumed in the last 24 hours?...HYDRATE! 3. How many hours have you slept in the last 24 hours?...SLEEP! 4. How long has it been since you went outside or got some exercise?...EXERCISE! 5. When was the last time you met someone in person?...CONNECT! The answers to these five questions will help you to satiate some of the most basic human needs: hunger, thirst, sleep, exercise and social connection. Everyone has periods of feeling ‘emotional’, seemingly for no reason. However, the signals our mind and body transmit are rarely without reason. When our basic needs are not adequately met, it can lead to changes in our mood, capacity to think, learn and even make decisions. Nutrition and hydration are not only vital for physical health but play an indispensable role in our mental health as well. Avoid processed and sweetened foods and try to nourish your body with a balanced wholesome diet. Being hydrated plays a vital role in maintaining your mood and energy levels. Even mild dehydration can interfere with brain functioning and affect your ability to focus. Drink plenty of water or other unsweetened beverages. Getting sufficient sleep is also equally important. A well-rested mind and body are more efficient and alert. Lack of adequate sleep impacts physical and mental health. It can also negatively impact your ability to learn, think and retrieve memories. A little fresh air can do wonders for your mood. It is clinically proven that regular physical exercise helps the release of endorphins, which in turn trigger positive feelings. If you have been cooped up indoors for hours, try to step out for some time. If weather permits, maybe you could even work outdoors. If going out is not an option, just stand on the balcony/terrace/window or even just move around the house! One of the less talked about human needs is the need for connection. Talking to another person - whether about your feelings or even the weather - helps to reduce the sense of isolation and uplifts your mood. You might prefer working alone or don’t mind not having human company all the time. However, even for the self-proclaimed ‘loners’, a little social connection is essential! Most of the time, addressing these basic needs of food, water, rest, exercise and connection help in uplifting your mood and energy. However, if it doesn’t seem to help, or if the lows keep coming back, speak to your doctor and/or therapist about it. Self-care is an ongoing practice and not a last-ditch effort to salvage your emotional health. I hope you make it a regular practice to look after yourself!